The Theodore and District Rec. Board has been around for many years, and have always been there to support Theodore in assorted fundraising events and donations to Village projects. The Board could always use a few new volunteers to help share the workload, if you think you could spare some time, drop in on a meeting some time and see if it's something you'd like to be a part of. Stay tuned for details as the map for the upcoming year gets set so you can plan ahead and make plans to attend! 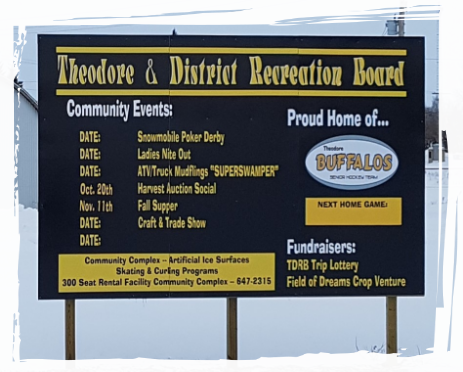 Look for the Theodore Recreation Board page on Facebook which is updated regularly! Click on the Link to take you to the page directly. April 6th - Ladies Night - Theme "It's 5 o'clock Somewhere!"